No, I still don’t have my test results back (total bummer), so we are going to need another vegan update (hopefully next week), but the experiment still lingers in the back of my mind. I think about it when I make my food choices. I now add more vegetables when I order something or plan our meals (although I could still probably use more). Please don’t assume I’m always healthy because I teach pilates. I could happily eat a bowl of pasta with Ragu for one or two meals a day. It’s easy and, what can I say, I like my carbs. When I was vegan for a month I craved three things constantly: avocado (which I could have so it wasn’t a problem), eggs, and chocolate milk from Fish Family Farm in Bolton. 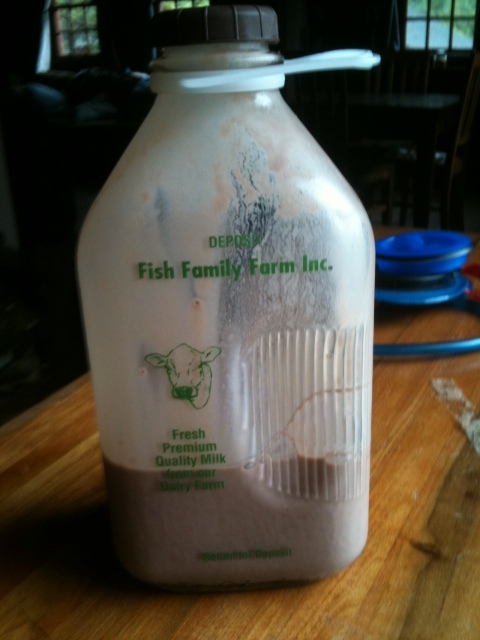 I have only had chocolate milk from the Fish farm once, but I couldn’t get it out of my head. The first Monday I was free to eat as I pleased, I took the 25-minute drive to Bolton to get my chocolate milk, and there was none. Apparently they make their milk on Monday and don’t guarantee to have it ready until after 2pm. I couldn’t believe it. So the next Monday I made time again (not a really easy task because I’m pretty busy). I pushed off some paperwork I should have been doing to go get this chocolate milk. I’d clearly become obsessed. This time I went with friends and told them my story, and said I hoped they had the milk this time. We were getting there around 4:30pm, so I was now afraid they would have run out. Uh oh. I stopped being vegan and milk doesn’t taste good anymore. I never liked milk enough to drink it plain, but I liked it on cereal. Now when I put it on cereal it just tastes really funny. I never liked any of the non-milks I tried while vegan, so I’m sort of at a loss. I think I’m just going to have to learn to like milk again or stop eating cereal. Maybe it will pass. I seem to really be able to taste dairy in foods. Baked goods that I ate all the time really taste buttery to me now. I don’t mind. I appreciate that I can really enjoy some of the flavors that I didn’t really notice or think about before. A double edged sword from my vegan experiement.